First, it is important to understand the environmental requirements when painting. Most people think of these things when looking to paint outside “temperature, moisture, and so on. These same things can make a huge difference inside. If there is too much humidity inside a home during the winter, painting can be problematic. Moisture changes how paint dries. 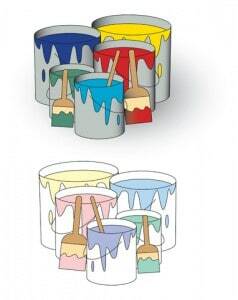 It takes longer for the paint to dry and can lead to problems with running, mixing, and even bubbling and cracking. One fix for this is to invest in a space heater or dehumidifier to dry out the room where the painting is to take place. Another consideration for home painters in the winter is the temperature. If the paint has been stored at too cold a temperature, or if the walls are too cold, paint will have a problem mixing, adhering, and could also leave a streaking pattern in the strokes. To avoid this, paints should typically be stored at temperatures great than 50 degrees Fahrenheit. The walls should also be at least this warm before applying any paint and while paint is drying. When dealing with oil and alkyd based paints, the temperature should be at least 40 degrees. Another major consideration that these house painters can advise on is how much a difference color makes. There are always colors that people like, but they do not always have the same effect when on walls or accents. Furthermore, the right colors can help calm, increase productivity, or otherwise have an effect on mood. Red, for example, is known to increase the energy level in a room. These are great colors for a living room or dining area, where people are likely to be drawn together. Studies have shown that the color red can raise blood pressure, speed up respiration and heart rate. Yellow is known for its warm and welcoming nature. It is good to use in entryways, hallways, and small areas. Yellow in larger quantities, however, has been shown to induce people to be more likely to lose their temper or cause infants to cry. Blue is seen as a relaxing color. It has been shown to have the exact opposite effect as red and should be balanced with warm colors on accents and in decorations and furnishings. The experts at Pristine Painting & Decorating specialize in house painting and have been making homeowners happy for years providing quality, affordable, friendly painting services throughout Dupage County, Illinois.